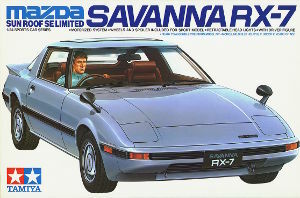 Tamiya was the only model kit company to bother doing a 'face-lifted' version of their 1st generation Rx-7 model kit and I for one am very grateful for that. This kit was rereleased as cat. nr. 24016 by Tamiya's factory in the Philippines. Tamiya did a thorough job updating the body, the new tail light cluster is well represented. Tamiya also included a choice of sunroofs, a solid one and a transparent one, the latter even comes with a translucent brown decal for tinting it to 'Moon Roof' specs. Also new is the rear wiper and the optional rear spoiler, which were introduced on the 1980 model. To make room for these new parts on the parts trees, Tamiya had to throw out the floor panels, so this kit comes without pedals. The model kit depicts a japanese SE (top of the line) type, so the rear view mirrors are mounted on the front fenders, not on the doors. A driver figure and a slightly oversized rear spoiler are included, the original release also came with an electric motor and lightbulbs for the head lights. There's a choice of two sets of authentic alloy wheels, one depicting the 'rotary wheels', the other are street versions of the eight-spoke 'Speed Star Mk.III' racing wheels that were fitted to the factory team race Rx-7's of the time. In real life, the rotary wheels came as standard on full-option models in Japan and Europe, whilst the Speed Star wheels were available through Mazda's Mazdaspeed race support outlets. The headlights can be raised and lowered by operating a push rod that sticks through the radiator shroud on the floorpan. In 2018 'DiOlex Production' created some resin replacement wheels for this kit.